With over 400 casino and slot games, a list of awards as long as your arm, and new titles in every month, All Slots Casino is one of the world’s best. Running on world-famous Microgaming software, featuring huge bonuses, regular tournaments, and iPhone and Android apps, you’ll find the perfect game, no matter what your tastes. Take your pick from three-reel classic slots, five-reel slots, video slots, progressive slots, and classic fruit machines. Also look out for more than 200 types of online blackjack, video poker, poker, roulette, craps, scratchcards, baccarat, and much more. Loads of clear instructions, great gameplay, smooth graphics, are all hallmarks of Microgaming software. All Slots Casino has Live Dealer Table games, for an added touch of glamour. The site has had a recent overhaul, but it’s still colourful and cartoony, and easy to navigate. Chirpy and cheerful, just like you will be if you scoop one of their enormous progressive jackpots. All Slots Casino uses the best in the business – Microgaming, who created the world's first online casino back in 1994 – you may want to note they have also has a stack of awards. Featuring amazing graphics and sounds so realistic you may think somebody has installed fruit machine in the room, Microgaming is a byword for quality. Either play straight from your computer via Flash, or download for even quicker gameplay and smoother graphics. All Slots Casino has recently launched several new Android apps, and you can download games on to your iPhone, iPad and various smart phones. A simple 100% first deposit bonus awaits you. This means if you deposit £200, they will match it by an extra £200. You also get 10% cash back on all deposits, and you can claim up to 450 credits each month, or 5000 credits year. Refreshingly, All Slots Casino has a transparent bonus system, called ClearPlay - this means you can withdraw money at any time, no strings attached. See at a glance which bonuses you have remaining to be played, and convert cash for withdrawal at the click of a button. here is even an interactive ClearPlay tour, so you can see just how it works. Now, this IS a VIP club worth joining. As a VIP player, you get extra perks, benefits, higher bonuses, and even customised gifts to celebrate special occasions. You also get a Private Gaming Suite in the VIP Lounge Casino, and extra special service from the VIP support team. All Slots Casino was founded back in 2000, as part of the Jackpot Factory Casino Group. Licensed in Canada by the Kahnawake Gaming Commission, it’s one of the oldest and best in the business. Players flock to All Slots Casino from the world over (except North America) and they accept all major cards and e-wallets, withdrawals are processed Monday to Friday with a 24 hour pending state. There is a clear timetable under the Banking tab on their homepage, explaining how long it takes to get your hands on your cash. 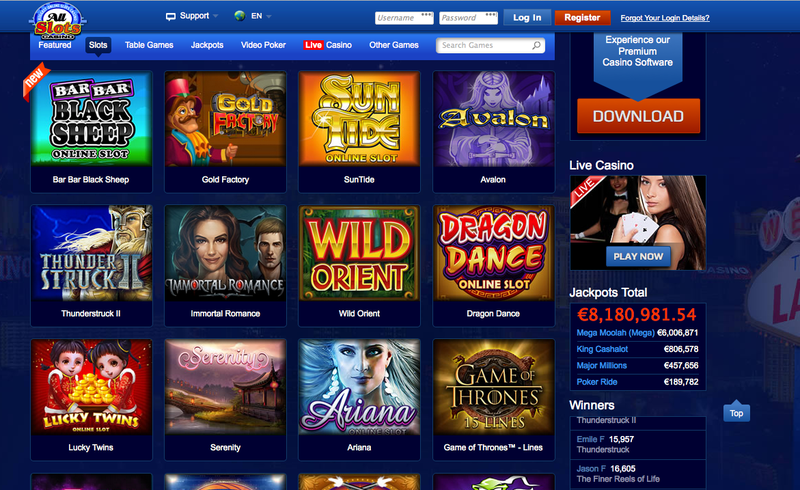 Once again, the ClearPlay system, exclusive to All Slots Casino, really is good. If only every site could be so transparent with payment and withdrawal methods. All Slots Casino comes with the prestigious eCOGRA seal of approval, and the software uses Secure Socket Layer Digital Encryption. You can request a monthly payout report to see the percentage of payouts made at the casino, and there’s also a nifty little feature which allows you to check out your own gaming habits, i.e.. how much you have spent/won on a certain game. This will certainly please the analytical, strategic players amongst us no end. Yes, For every 10 credits wagered you get 1 loyalty point. 1000 points can be redeemed for 10 credits.